1719 Triple Unite 1643. Oxford mint. 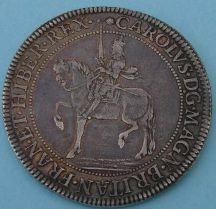 Charles I Mint mark plume with bands, on obverse only. S2727. North 2384 (Very Rare) Schneider 295. Obverse, ornate taller bust CAROLVS. D: G: MAGN: BRIT: FRAN: ET: HIB: REX. Reverse, ‘Declaration’ on continuous scroll RELIG: PROT: LEG: ANG LIBER: PAR (This is Charles promising to protect ‘the religion of the Protestants, the laws of England, the liberty of Parliament’) with denomination numerals (III) above and date 1644 below. A tiny piece of excess metal is evident on the reverse above PROT. This is the same original flaw as seen on the Schneider specimen from the same dies. EF, An exceptional coin, fully round and well centred. All lettering and detail crisply struck. The Triple Unite was produced in the early years of the English Civil War in the period 1642-1644 and it was the most spectacular coin issued during a reign known for its numismatic diversity. Charles I moved his base from London to Oxford in 1642, but Parliament had secured the support of the City of London with its bankers and merchants. Nevertheless the king was determined to continue the production of gold and silver coinage and set up the Oxford mint in New Hall Inn, Oxford. The Triple Unite was in effect a large propaganda piece produced by the Royalists in their ongoing clash with the forces of Parliament, and was made in very small numbers over a 3 year period. 1847 Half-laurel James I third coinage m.m. trefoil 1613 fourth bust (Schneider 92, S2641A, N.2084) VF, a tidy piece with the centres in low relief as is usually the case for the James I gold coinage. Also with some light double striking at the beginning of the reverse legend. Overall, aesthetically pleasing. 854 Anglo-Gallic. Henry VI (1422-61) gold Salut D'or, 2nd issue September 1423. Mint mark crown. Paris Mint. Good very fine. 729 Hammered (14). Includes Edward I, Edward III, Henry VI, Edward IV, Elizabeth I and Charles I together with two Venetian gold ducats these with a gold content of around £50 each both pierced. Mostly fine. 1806 Crown Charles I. Briot, 1st milled issue, mint mark flower and B. S.2852. very fine or better, green/gold toning. 1899 Penny Edward the Elder (899-924) silver, small cross, R. moneyer Wulfred in two lines divided by three crosses. North 649. S.1087. Ex Locket. Choice extremely fine, golden toning. 1889 Laurel James I gold, 3rd coinage, fourth head, mint mark trefoil. S.2638B. Good very fine, but with scratches in field. 859 Shilling 1656 Commonwealth, mint mark sun. S.3217. About extremely fine with golden toning. 1208 Anglo-Gallic. Henry VI (1422-61) gold Salut D'or, 2nd issue September 1423. Mint mark crown. Paris Mint. Good very fine. 178 Quarter Laurel James I gold. Mint mark rose. 1620-1. S.2642. Slight crease marks, good fine/about very fine. 1363 Halfcrown Gold James I, second coinage, 3rd bust, mintmark tower 1612-13. Almost very fine with slight crease on obverse. 691 James I gold half crown, second coinage, 3rd bust, mintmark tower 1612-13. Almost very fine with slight crease on obverse.